Japan is culturally rich and its traditions and customs vary greatly from the West. With this itinerary you’ll get under the skin of the country, exploring both cities and rural life. Starting in Tokyo you’ll enjoy the best the city has to offer before heading to beautiful Hakone where you’ll glimpse Mount Fuji. Staying in ryokan you’ll bathe in hot springs and stay in traditional Japanese accommodation. Take the famous bullet train to rural Japan and sample sake at a traditional farmhouse as you experience Japanese family life. Onwards to Kanazawa and Hiroshima where you’ll have the chance to remember those affected by the events of 1945. The itinerary ends in the former imperial capital of Kyoto where you’ll explore the city and, if you like, have a chance to meditate. Arrive in Tokyo, where you will be met at the airport by a guide who will help you get to your hotel. The following day, you will take in some of the many highlights Tokyo has to offer with a local guide by public transport. First stop is Meiji Jingu, Tokyo’s most famous shrine dedicated to the spirit of the late Emperor Meiji. The shrine is a popular site for Japanese weddings, and if lucky, you might see a wedding taking place in traditional Shinto attire. Travel through time, from the “old” Tokyo to “new” Tokyo, as you walk to Omotesando. Commonly referred to as Tokyo’s Champs-Elysees, this broad, tree-lined avenue features a multitude of fashion flagship stores designed by internationally renowned architects. A short subway ride will take you to Asakusa, a part of Tokyo’s shitamachi, or old town. Asakusa is the city’s oldest Geisha district and also the home to Sensoji Temple, Tokyo’s oldest Buddhist temple. The streets around Sensoji feature many traditional shops that sell Japanese crafts and souvenirs and are a delight to wander through. Make an early start today and leave Tokyo behind to take the 1.5hr journey to Hakone, the gateway to Mt. Fuji and its surrounding national park. This small town is famous for its onsen (natural hot springs) and has natural beauty in abundance enabling you to experience authentic Japanese living. You have the rest of the day to explore all that Fuji Hakone National Park has to offer. Armed with your included Hakone Transport Pass, you can take advantage of the numerous forms of transportation on offer throughout the park. You can ride the Guinness World Record-holder ropeway all the way up Mt. Owakudani, passing over sulfurous fumes, hot springs, and hot rivers in this volcanic area. You will also have the opportunity to eat one of Hakone’s specialities, the kuro-tamago, an egg hard boiled in the sulphuric hot springs. They say that if you do, it will add seven years to your life! A majestic replica pirate ship will sweep you across Ashinoko, a lake that was formed by a volcanic eruption 3,000 years ago. The Hakone Tozan “switchback train” zigzags through the mountains, giving amazing views of the surrounding valleys. Throughout the day, you will have the chance to get a glimpse of Mt. Fuji, but bear in mind that she is a notoriously shy mountain and it needs to be a clear day for you to see her splendour. Tonight you will stay in a ryokan, or traditional Japanese-style accommodation, complete with tatami mats, shoji (rice paper) sliding doors, and onsen (hot springs). In the evening, relax in your yukata, or lightweight kimono, and dine on a sumptuous kaiseki (multi-course) meal. An onsen after dinner is highly recommended before you bed down on your futon. Time for one last soak in the onsen before undertaking the 4.5 hour train journey to Takayama. Your first leg will be on the world-famous shinkansen (bullet train), which can reach speeds of up to 230kph. You will then change to the limited express train ‘Hida Wide View’ for one of the most scenic train journeys in Japan, winding your way through tall mountains and stunning gorges. Due to its previously inaccessible location nestled high in the mountainous Hida alpine region, this beautifully preserved old town was cut off from the rest of Japan, thus allowing it to develop its own unique culture. This afternoon, we recommend visiting one of the town’s many sake breweries for a taste of the local drop, its high quality owing to the area’s clean water sources. In Takayama, you will be staying in a ryokan, a traditional Japanese-style accommodation, complete with tatami mats, shoji rice paper sliding doors, and onsen baths. Tonight, relax in your yukata, or lightweight kimono, and dine on a sumptuous kaiseki (multi-course) meal. Dinner will be sure to include some of Takayama’s famous cuisine, including Hida Beef, which is said to be the second best in Japan after the world-famous Kobe beef, some sansai local vegetables, and miso. After breakfast, head up to the Miyagawa morning market, where locals come to sell crafts and produce. It’s also a good opportunity to try some of the region’s delicious fruit and vegetables. A short ride from the market will take you to the Takayama Festival Floats Museum, which displays the beautiful floats that parade during the famous Takayama Festival. The museum is a bit separated from all other main sightseeing spots in Takayama. Shortly after lunch, get back on the road as you take the bus to your next destination, Shirakawago. Shirakawago, and its neighbouring Gokayama region, lines the Shogawa River Valley in the remote mountains that stretch from Gifu all the way to Toyama Prefecture. Both of these prefectures are famous for their traditional gassho-zukuri farmhouses, some of which are more than 250 years old. They were also declared as a UNESCO World Heritage Site in 1995. Gassho-zukuri means “constructed like hands in prayer,” as the farmhouses’ steep thatched roofs resemble the hands of Buddhist monks pressed together in prayer. The architectural style developed over many generations, intricately designed to withstand the large amounts of heavy snow that falls in the region during winter. The roofs, which were constructed without nails, provided a large attic space used for cultivating silkworms. Tonight, you will stay in one of these farmhouses, a great way to experience a traditional Japanese family home or minshuku, and get the chance to become more intimate with gassho-zukuri buildings. Rise up early today as you continue on with your journey by bus, heading all the way down to Kanazawa. In the 17th century, this beautifully preserved castle town used to be Japan’s wealthiest area and a thriving center for culture and the arts. Our suggestion for the day is to take the Kanazawa Sightseeing Bus to visit some of the major highlights in the city. Start with the pristine Kenroku Garden, which is ranked as one of Japan’s top 3 gardens. The name ‘kenroku-en’ literally means ‘Six Attributes Garden,’ and it has been said that a perfect garden comprises of these six attributes – spaciousness, seclusion, artifice, antiquity, water-courses, and panoramas. Located adjacent to Kenroku-en is Kanazawa Castle, which can be easily accessed through Ishikawa Gate, one of the major gates of the castle. One unique characteristic of Kanazawa-jo is that its whitish roof tiles are made out of lead. Make your way to the final suggest stop of the day which is in the Higashi Chaya District, one of the three, well-preserved chaya districts in Kanazawa. A cha-ya, which means ‘tea house’ in Japanese, was where geisha used to entertain her guests with a song or a dance. Here you will find Hakuza, the shop that sells Kanazawa’s speciality – gold leaf products. The tearoom inside the shop is totally covered in gold! Today is at your leisure to explore more of this amazing city. We suggest starting with Nagamachi, the old samurai district of Kanazawa. Here you will find Nomura-ke, a restored samurai house that showcases the artefacts during the golden era of the Japanese warriors. Across town is the 21st Century Museum of Contemporary Art, which is known for its progressive architecture and ever-changing exhibits. Also in the area is the D.T. Suzuki Museum, a homage to the man who helped bring zen Buddhism to the west. Kanazawa is also home to many interesting temples as well as a bustling seafood market that you may want to explore. Back on the train for the 4.5 hour journey to Hiroshima. The first leg of your journey will be via the limited express ‘Thunderbird’, which will give you views of Japan Sea and Lake Biwa. The second journey will be via another shinkansen. Perhaps more than any city in the world, Hiroshima is famous for one moment in history. On 6 August 1945, it became the first target of an atomic bomb. However, Hiroshima has risen phoenix-like from the ashes, and rebuilt itself as one of Japan’s most laid-back, vibrant cities full of wide boulevards and art museums, great food, and friendly, welcoming people. This afternoon head to the Peace Park and Museum for a sobering reminder of the events of 1945. However, far from being a depressing experience, the overriding theme of the Museum is one of hope and peace. Today take a short ferry ride to Miyajima Island, a famous wooded island located in the Inland Sea near Hiroshima. Here you will find perhaps the most photographed site in Japan – The Floating Torii Gate. Famously known as one of Japan’s ‘3 Most Beautiful Views’, the shrine itself dates back to the 6th century and is designed in a pier like structure. Mere “commoners” were not allowed to set foot on this holy place. 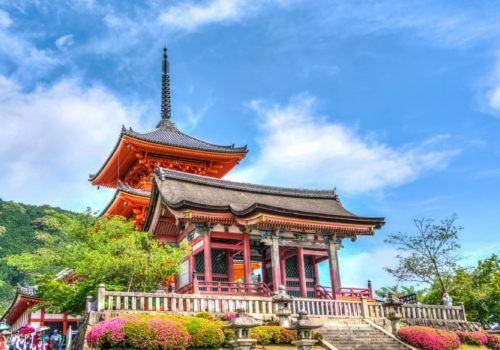 You will have time to explore the island and its many shrines and temples, sample local goodies like maple leaf shaped cakes, and have the option to hike up to the peak of the island, Mt. Misen, to see spectacular views of the surrounding islands. Time for one last ride on the Shinkansen for the journey to Japan’s cultural capital, Kyoto. Kyoto is home to an astonishing 2,000 shrines and temples, including 17 UNESCO World Heritage Sites. Explore the former imperial capital with a knowledgeable local guide using public transport. You will start your day with a visit to Nijo Castle. This ornamental castle, surrounded by stunning gardens, was built by the founder of the Edo Shogunate as his Kyoto residence. The main building was completed in 1603 and is well-known for its Momoyama architecture, decorated sliding doors, and ‘chirping’ nightingale floors. Continue on to Ryoan-ji, the site of Japan’s most famous rock garden. Originally served as an aristocrat’s villa during the Heian Period, the site was later on converted into a Zen Buddhist temple in the year 1450. Now, it belongs to the Myoshinji School of the Rinzai sect of Zen Buddhism and serves as a perfect spot for a zazen meditation. You will also visit Kinkakuji, or the Golden Pavilion, which was originally built as a retirement villa for the Shogun. After his death, it became a Buddhist Temple at his request and is now one of Kyoto’s most famous temples. Next in the list is Kiyomizu, or “pure water,” Temple. From the 13-metre high veranda jutting out from the main hall, you can enjoy amazing views of the whole of Kyoto, whilst pondering the fact that both the main hall and the veranda were built without the use of nails or any kind of joiners. Before the tour ends, stroll through the atmospheric Higashiyama district, wherein busy lanes lead up to Kiyomizu and are filled with quaint shops selling souvenirs including Kiyomizu-yaki pottery, sweets, and pickles. The following day, we have in store for you an amazing experience as you learn more about the Japanese culture in a machiya, a beautifully restored wooden townhouse that is typical for Kyoto. You will first get a short tour of the house and an explanation of the architecture before trying on a kimono, the traditional Japanese garment. This is followed by an induction to the tea ceremony, a quintessential part of the Japanese culture. The tea master will teach you every movement that is crucial in preparing and serving the tea.